August 15, 16 and 17th of 2015 saw many visitors come to the Saugeen Amphitheatre during the weekend to witness the beginnings of an old age roundhouse being created. International Instructors and the Saugeen Dry Stone Crew were on hand with an Introductory walling course. A Carving course instructed by renowned Artisan, Nicholas Fairplay was also well received. Neil Blythin - Blacksmith was also on hand to showcase the art of blacksmith work and to answer any questions that visitors had. Neil also created some pieces on site as examples. Dry stone Roundhouse will continue. The Drystone Walling workshop was held during the weekend of Sat 24, Sun 25 of May 2014. There were many people on hand to learn and help create a drystone wall. Instructors: Master Craftsman and Chief Examiner: Andrew Loudon of the U.K. and Canada's own Master Craftsman: Dean Mclellan instructed the participants in creating a wall during the introductory course. All Participants had a great time learning the craft of Drystone walling. Thanks also go out to the Amphitheatre Drystone walling Crew (Mike Henry, Henry Mandawoub, Ronnie Ritchie, James D'Atri, Matt Wolfe, Shane Ritchie, Nathan Thompson, Tyler Kewageshig and Dallas Thompson) for their help and time in assisting with the workshop as well as to fellow instructors Patrick Callon, Menno Bramm and Kenny Davies. an impressive amount of people showed up on May 18th 2014 long weekend celebration for the Annual Fireworks display held at the Saugeen Amphitheatre. The show itself was fantastic with lots of “oohs” and “aahs”. 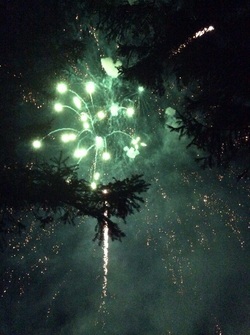 The array of colors, sounds of crackles, booms and sizzlers was a great treat for all in attendance. Vendors were also present to sell goodies, such as: donuts, glow in the dark sticks, candies, food and drink. A big thank you goes to Chief and Council, The Saugeen Fire Dept. and The Saugeen Economic Development Dept. for hosting the magnificent exhibition.